Animal Element has worked miracles with so many dogs-- you'll never know the difference it can make until you use it. Says Chris Jones, Founder and CEO of Animal Element : A lot of people don't "get" us horse, dog, and cat lovers. Maybe your horse trailer costs more than the truck pulling it, maybe you let your 80 lb German Shepherd sit in your lap or maybe a laser pointer pen and some catnip is all you need for hours of laughter. For years we've all been reading article after article about how we are destroying our environment and polluting ourselves. Unfortunately our animals can be exposed to even more toxins than we are. What can be done? Brought together by our common passion for natural healing and animals, Animal Element was formed by Michelle French and Chris Jones.Our mission is to make the most effective detox products for your pet. All of our personal pets use our products. I always say that I won't feed my dog anything I wouldn't take myself, except maybe fish flavored milk bones. You could say we put our product where our mouth is, literally. What Sets Animal Element Apart From Competitors? What makes Animal Element different from all competitors is that we promise to never use any fillers. All ingredients we use in our formulations are human-grade and non-GMO. We search all over the world to find the purest and best source of each ingredient in order to make sure your dog or small animal is getting the best of the best. We promise to never sell anything that we wouldn’t personally take ourselves. How Do I Know If My Dog Can Benefit From Animal Element? The best part about Animal Element is that ANY dog or small animal can benefit from our products. We have a large product line that continues to grow in order to meet the varying needs of all individual dogs and small animals. Even if your dog appears to be healthy, the truth is that he or she has come in contact with many toxins throughout the environment. Animal Element Small Animal Detox with Joint Support can help rid the body of those toxins so his or her full potential is within reach. We have an extensive product line that address specific issues, such as digestive health, bone and tendon strength, respiratory issues, and many more! How Long Should My Dog Be on Animal Element? We recommend that Animal Element Foundation Detox with Joint Support be given for the life of the dog in order to reach and maintain maximum benefits and optimal health. Your dog is constantly being bombarded with toxins throughout the environment. With the Foundation Detox with Joint Support being given every day, you are sure to give your dog what it needs to thrive! All other supplements in our product line can either be given for the life of the dog or can be given upon the need of that supplement. Each dog is an individual, so each regimen should also be individualized to fit the specific needs of your dog. What Makes Animal Element So Effective? Animal Element’s efficacy is found in the ingredients. Our formulations begin in research. We look for scientific evidence that proves the efficacy of each ingredient. Once the formulation has been completed with thorough research, we look all over the world for the purest and highest quality source. We only use ingredients that are human-grade, non-GMO and we promise to never use any fillers. Our love for nutrition and animals drives our passion. We have a deep desire to use only the best of the best. We promise to never give our animals, or sell anything to your animals, that we wouldn’t personally take ourselves. What Dog Products Are Available At Animal Element? Your dog, cat, or any other small animal is exposed to a wide variety of toxins from the environment, food, and drugs. The Foundation Detox is specifically formulated to assist in the removal of these toxins using Zeolite (Clinoptilolite), Diatomaceous Earth, Organic Kelp, Spirulina, Whole Raspberry Leaf, MSM (Methylsulfonylmethane), Whole Hawthorn leaf and Flower, Fenugreek, Organic Turmeric, Magnesium Citrate and Italian made Hyaluronic Acid. Animal Element Foundation Detox with Joint Support assists with muscle development, feed conversion rates, coat improvement, and the list goes on. The Foundation Detox is the baseline of the Animal Element program. All roads lead to the Detox. The Detox is formulated for daily use over your animal's life. What Do People SAY About Animal Element For Their Dogs? My 6 year old Chihuahua was given a ‘death sentence’ as his kidneys were failing. I was told there was “no hope”. Frantically I searched the internet for help. After talking to Chris and trying the product for only 1 month, my dog’s kidneys were back to nearly normal— the vet couldn’t believe it… neither could I. But I was beyond grateful. Doesn’t Your Dog Deserve To Be In His or Her “Element”? 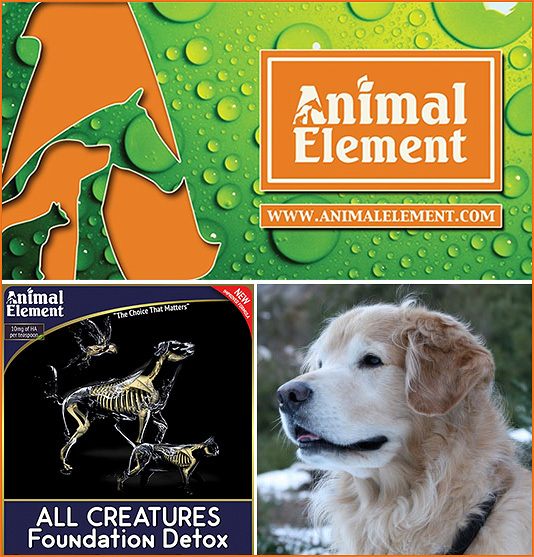 Order Animal Element Today! We are what we eat— and that is never displayed so vividly as with our dogs! Animal Element has no equal in the horse world— but don’t take our word for it— try it and see the difference that Animal Element can make for your beloved dog today. Visit AnimalElement.com and let us help your dog!